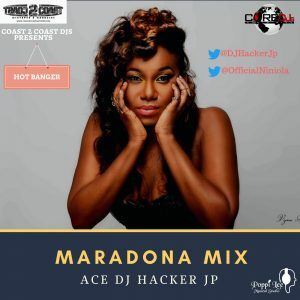 Coast 2 Coast DJs Group Presents The 4th edition of Ace DJ Hacker Jp Hype Rotation series, featuring “NINIOLA” . Niniola Apata (born 15 December 1986), better known by her stage name Niniola, is a Nigerian singer and songwriter. Signed to Drumroll Records. Associated acts are: Cobhams Asuquo, KCEE, Eddy Kenzo, Seyi Shay. DJ Spinall & Sarz. This Mixtape is fully loaded with dancehall songs….